Since no one is really painting on cave walls anymore, we have to agree that there’s just one art form that has survived since primordial times, and is practiced just as fervently and reverentially today as it was then, as it has been all along. And maybe from your mortal, temporal perspective, that’s true. But take a wider view, the artist’s view, and you’ll see it’s not quite so. Almost every medium is ultimately perishable, naturally enough—even the occasional Van Gogh canvas has been lost to the flames. But all artists must fantasize, don’t you think, about creating something bound to last for the ages. They all must yearn to fill museums and to astound patrons as yet unborn. If they choose to work on canvas, or in marble, or in a thousand other inanimate media, they’ve got the barest shot at that. But the artist who works with skin knows that in less than a lifetime their work disappears forever. Yet they carry on. How and why that is fascinates me—I’ve explored the question but I’m not quite sure I’ve found any coherent way to answer it. I’ve talked it over recently with David Maynard and Eric Starr, both of Arkham Tattoo. 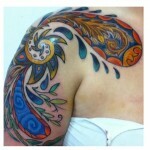 We started with this premise: that today’s tattooer is, and must be, an artist. Are there horrifying exceptions? Oh sure. But a modern convergence of events, namely the invention of the electric tattoo machine, and more importantly, the almost-mainstreaming of tattoo culture, means that market forces have attracted the best to the industry. 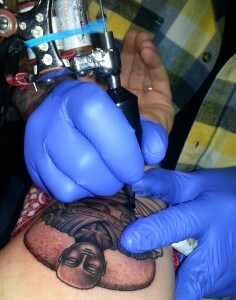 They’ve been given the tools, and the competitive atmosphere, to create tattoo art unlike anything yet seen. Watch them in action and you realize something almost at once: these artists could excel in just about any other form. Many of them could make their living as world-class illustrators, commercial artists, what have you. And realizing that makes you wonder about something else: Why aren’t illustrators, graphic artists, and all the rest trying their hand at tattooing? I asked Dave Maynard about that and he told me something enlightening—”A lot of them do,” he said. “They think it looks easy so they give it a try.” But there’s a temperament, he added, something unique about the tattoo artist’s outlook, that is apparently a non-negotiable job requirement. Lacking it, you simply don’t last. So what is it? Either Dave couldn’t articulate it, or I couldn’t grasp it. So I tried another tack. What about the customers? What brings them into the shop? I knew even as I asked that there could be no easy answer. The number of reasons for getting tattooed are just about equal to the totality of tattoos ever given. But whatever the reasons, they must be strong, maybe even overwhelming, to endure the process. Getting a tattoo is, at best, an intensely uncomfortable sensation. Sometimes it’s downright torture. To go through that, you have to be completely invested. Clearly, you’re invested in the outcome—this goes back to the “on you forever” thing of which we’ve already spoken. But, Dave told me, you need to be a partner in the creative process as well. The art on your skin must be as much your product as it is the artist’s. In fact, Dave told me, that’s one of his few deal-breakers. He said he tends not to tattoo anyone who doesn’t have at least some idea of what kind of art they’re going to wear. That’s when another lightbulb went on, and I recognized something else unique about the tattooing art. It’s the most intimate collaboration imaginable between artist and patron; not just because of the intimate nature of the medium (although that’s an undeniable factor), but also because the creative process is so equally shared. Yes, you can go into a tattoo shop, pick a piece of flash from the wall and ask to receive it line for line (I’ve done that very thing). But what you should do is have an idea for a custom design, something you can describe, something the artist can understand and expand upon. Do that, and you’ll receive a lifelong-lasting, deeply meaningful work that you helped create. By the end of the conversation I had a glimpse, maybe some insights, a partial understanding of why this art form has not just endured but continues to dramatically expand. I still had questions, though, and it bothered me that I couldn’t find my way to the answers. That’s when I realized what a fool’s errand I was on. The tattoo, like every other visual art, is in the final analysis ineffable—that’s why it’s visual. Try to express it in words, and it transforms into a novel or poem or koan. Try to make it answer questions or articulate a philosophy and it slips away from you like water through your fingers. This is no flaw or failing, it’s the entire point of the thing. 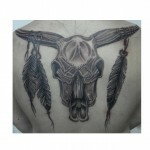 This entry was posted in Homepage and tagged Arkham Tattoo, Art, sub culture, tattoo, tattooing, what is culture?. Bookmark the permalink.